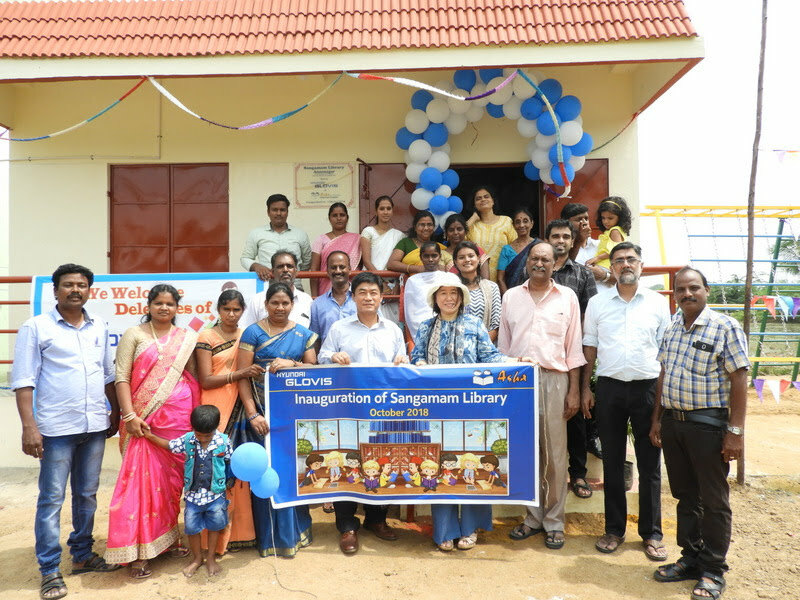 On 13th Oct 2018: The library at Annangar constructed with support from Hyundai Glovis was inaugurated. Click here to see photos from the function with captions. The “Sangamam Library – Annanagar” was inaugurated on Saturday, 13th Oct 2018. After really hectic work over the previous week (mainly by Srinivasan), all the things were ready for the inauguration function on the 13th morning. All the Ellapuram block teachers of Asha, Dharmi Chand, Muthu and Srinivasan were there well before the inauguration time. Rubini the Glovis CSR coordinator was also there helping out. The library and the adjoining play area were beautifully decked up for the function. This was done courtesy Mr. Bharathidasan the Headmaster and the other government teachers of the school. The Managing Director of Glovis, Mr. Park and his wife reached the school at 10:30. A small Pooja was held with the breaking of Poosanikaai. Then Mr. Park inaugurated the library by cutting the ribbon. Mr and Mrs. Park looked at the library and interacted with the children there. Then we all moved to one of the school buildings for the function. After Tamil Thaai Vaazhthu, the HM welcomed all the guests with Pon Aadai. Mr. Srinivasan of Asha also welcomed all the guests. Guests also included HMs from the neighbouring schools at Kannigaiper and Palavakkam which are also supported by Asha and Glovis. There was then a welcome dance by the girls of the 5th standard. Then Rajaram spoke of his vision for the libary and education centre. It should serve as a library, a home work assistance centre, a computer centre, a story telling and craft activity centre, a centre where enternal talented people can be brought in to train and engage with the children, a centre for sports etc. The new librarian, Thilothama, a college girl from the same village was also listening. Then Mr. Park spoke about the desire of his company to help the rural areas and the importance of this library and education centre for the children. Rubini, the Glovis CSR coordinator also spoke a few words. Then the function ended. Snacks were given to the children of the school. Then the guests also had snacks which included juice, Kesari and Vadai. After the snacks we stepped outside for tree planting. We are planting 10 trees around the school grounds. Two of the trees were left unplanted to be planted by Mr and Mrs. Park. After this we inaugurated the play area along with the children. The children then took all of us for a walk around the village. They took a special liking to Mrs. Park and Vanya the 3 1/2 year old girl. They showed their huts and the games they play in the village. I think the library should be a great joy to these young kids. In the process if it also improves their education, that would be the icing on the cake. Then the Parks took leave. We stayed back to distribute uniform sarees to the teachers from the Ellapuram block. Click here to see the new articles mentioned above.